You are here: HomenextPeoplenextPlayer ProfilesnextSmith, Charles Albert "Whacker"
Charles Albert Smith was born in Gloucester on 18th July 1878, the son of a corn porter. His father died when he was aged six, and remarried when he was eleven. Charles developed into a sturdily built, auburn-haired, left wing, known to one and all by his nickname “Whacker”. He played for Gloucester from 1897 to 1908, making 270 appearances, and scoring 142 tries. He was a formidable character – a contemporary assessment said “Whacker is fairly fast, kicks well, and tackles magnificently, and when near the line is difficult to stop” -“most resolute whatever conditions face him”. His defence may have been his main claim to fame, but he also broke try-scoring records and won a cap for England. Whacker’s debut in first-class football was made against Newport on 6th March 1897; Gloucester lost 0-3 at Kingsholm and it was his sole appearance that season, although he did also play 2 games and score three tries for the A team. He made six appearances in 1897-98, his first against Stroud on 26th February 1898, and the second against Weston-super-Mare; he played eight games and scored four tries for the A team. He also made his mark with Gloucestershire, winning his first cap against Midland Counties on 19th October 1899, scoring his first try against Devon on 18th November, adding another against Durham, and finishing the season with six County caps. He made three appearances for Gloucestershire in 1900-01, against Midland Counties, Cornwall and Somerset, all three games being won comfortably; Whacker scored two tries against Midland Counties and one against Somerset. This helped to bring his sterling qualities to the attention of the England selectors, and he was selected for two trial games, for the Rest of the South v London and the Universities, and for the South v the North. This resulted in his being picked for England on the right wing for the match against Wales at Cardiff on 5th January 1901, with the declared aim of his selection being “to stop the Welsh backs scoring”. WB reported that: “Whacker’s display for England against Wales did not please the northern critics, but the Gloucestrian was badly served owing to the poor form of his centre. Despite this fact, Smith did some splendid defensive work for which, however, he got little credit.” Wales won 13-0, and it was to be Whacker’s only international cap. In 1901-02, Whacker opened the season with eight tries against Clifton, which set a new individual try scoring record. This has never been matched since. He also contributed to a total haul of 18 tries by Gloucester in the match, which also set a new record, which has been equalled twice since (against Exeter in 1975 and against Guy’s Hospital in 1977) but never beaten. He scored two further tries in the second match of the season against Old Edwardians, and another at Northampton in the third match; only a 0-0 draw against Newport in the fourth game brought this try fest to and end. Later in the season he scored four tries against Stroud, two ties apiece against Coventry (home and away), Bath, Penarth (home and away), Northampton, London Welsh, and finished the season as the leading try scorer with 29 from 27 games. It is perhaps no surprise that when Whacker was laid up for a period, the Club forked out 7s 6d in massage expenses for him. For the County, he played in all their matches – against Midland Counties he scored a try in the 26-3 win; his two tries against Cornwall at Camborne won the game 6-3; but he did not score in the draw with Somerset, the win against Devon or the 3-9 loss to Durham in the County Championship Final played at Kingsholm on 5th April 1902. He was selected again for an England trial with the Rest of the South v London and the Universities, but he progressed no further, and his solitary appearance at Cardiff proved to be his only international cap. The biggest match of the season was the visit of the All Blacks to Kingsholm, and Whacker had the honour of playing against them. The visitors proved far too strong for a Gloucester side which suffered injuries before and during the game, and received a battering to the tune of 0-44. Nevertheless, in retrospect many of the Gloucester players regarded the match as the highlight of their rugby careers. After an absence of more than two years, Whacker was restored to the County side for the last match of the season, when they had failed to register a single point in their previous two County Championship matches – that dismal record continued with a 0-0 draw against Cornwall at Redruth. On 3rd November 1906, Whacker was originally selected as reserve, but received a late call-up to play for Gloucestershire against the South Africans at Kingsholm. He was soon in the action: “Loubser sailed away in grand style; Wood only partially checked the dashing right wing, but “Whacker Smith got across, and brought off a superb tackle”….. “Whacker Smith stopped Le Roux when he looked all over a scorer” and …..”Hirsch, after one grand effort, was pounced upon by Smith and Wild on the line, and a try saved”, but the nature of the game was such that all his contributions were defensive – “Whacker Smith put in some deadly tackles, but he was beaten more than once by the speed of the opposition”, andthe visitors ran out 23-0 winners. A week later, on 10th November 1906, Whacker turned out for the County again, when they lost 8-15 to Devon at Exeter – this was to be his last game for Gloucestershire. Whacker did manage the one more season with Gloucester, making 21 appearances in 1907-08, and scoring six tries, his last coming against London Welsh on 18th January 1908. Having played his first game against Newport, he was anxious to play his last game against them as well, on 28th March 1908. However, an injury sustained a week earlier prevented this, and that game against Cheltenham on 21st March 1908 proved to be his last. He completed his Club career with 270 appearances, 142 tries, one dropped goal, and 430 points. He won 20 County caps with Gloucestershire, scoring nine tries, and won one cap for England. During eleven seasons for the Club, he rendered splendid and loyal service, always putting the Club first, even at inconvenience to himself personally. For three seasons Whacker topped the list of try-scorers in 1901-02, 1902-03 and 1903-04, and he was second to Hudson in 1904-05. 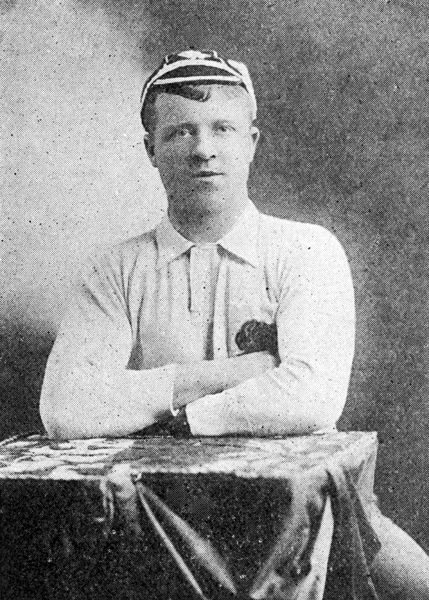 He scored 8 tries in one match (against Clifton in 1901-02), which is the individual record for the Club. He also scored six tries on another occasion against the same team, five against Coventry in 1903-04, and five against Plymouth in 1905-06. These scores show that he was a strong force in attack, but it was in defence that Whacker made his name. For several years he held the reputation of being one of the finest tacklers in England, and Welsh players especially had reason to remember him in this respect. All through his career Whacker played the game as it should be played, and he was one of the fairest and straightest of men both on and off the field. “Whacker’s” withdrawal cannot but give cause for regret, for he has been one of the most popular figures in the Gloucester team for quite a long period, and both at Kingsholm and on visiting grounds he will be greatly missed. Smith’s football career has been a distinguished one, for in addition to playing 270 games for Gloucester City, he has represented the county on 20 occasions, and gained both his South and International caps. “Whacker’s” debut in first-class football was made against Newport on March 6th 1897, and he was anxious to make his exit on the occasion of the recent meeting with the redoubtable Usksiders, but an injury sustained against Cheltenham prevented the veteran appearing in to-day’s game at Kingsholm. The report on the Club AGM in June 1908 noted that: “Before the meeting closed the Chairman said he had a very pleasing duty to perform, and that was to present Mr C Smith with a testimonial subscribed for by members and friends in recognition of the splendid services rendered by the veteran to the club. The appeal for subscriptions met with a hearty response, and the total sum collected was £47. The recipient had been consulted as to what he would like, and had chosen an English lever watch and gold chain as an instalment, the balance being invested for another present later on. The inscription on the watch was as follows: “Presented to C Smith (Whacker) in recognition of eleven years splendid service with the Gloucester Rugby Football Club. June 12, 1908.” Mr Brown paid a high tribute to Smith’s long and excellent services, and to his ability as a player. Whacker, who met with a great ovation, briefly returned thanks. The death occurred somewhat suddenly to-day of Mr Charles (Whacker) Smith of Bull-lane, Gloucester, the former well-known Rugby three-quarter. Mr Smith, who was 61 years of age, returned home from work on Tuesday and complained of feeling unwell. Influenza developed and last night he was removed to the Royal Infirmary, where he died. He rendered splendid service to the City Rugby Club for many years. He made numerous appearances for his county, and once played for England, in 1901 against Wales, at Cardiff. He was a fine defensive player and very plucky and determined in attack. His first appearance for Gloucester was in 1900, the fourth year of Walter Taylor’s captaincy. That season provided some brilliant victories for the club, and in the following year, when George Romans took over the captaincy, the team worthily upheld the Club’s reputation. This season was remarkable for the phenomenal scoring against Clifton – 66 points to nil in the first match, and 72 points to 3 in the return game. In the latter fixture Romans converted 11 out of 15 tries, six of which were credited to G Clutterbuck. But “Whacker” Smith beat this individual record the following season against the same club, crossing the line no fewer than eight times. The full score was 10 goals 7 tries. Mr Smith was employed for many years by J Romans & Co Ltd, timber merchants, of Gloucester. Thanks, Mervyn – most helpful, and we have now updated our records! Whacker played alongside my grandfather Ernie Hall in the 1905 side but also with his 2 brothers (my grand-uncles) Charlie and George Hall in the earlier 1900’s sides.